Roof Cleaning in Marlton NJ is a bigger deal than you’d think. Just take a look at all the fine looking homes throughout the neighborhood. Well manicured lawns and pristine property grounds make our community great. There is but one glaringly obvious blight common to many homes. There are the dreaded black streaks on roofs. How do they get there? What is the cause? How do we get rid of them and improve our curb appeal? There are a few of the many questions Marlton homeowners have. Fortunately, Aqua Boy Power Washing is the LEADER when it comes to soft wash cleaning your roof. We are local to Marlton and live right in our town. No wonder why many homeowners turn to us for roof cleaning. We’ve been doing it for over a decade in Marlton, and our 500+ certified reviews will show you why we’re king. 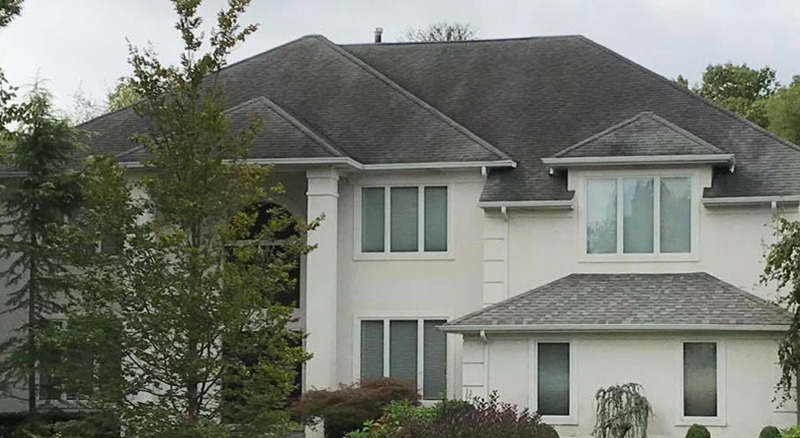 Just take a look at the results we achieve below for roof cleaning in Marlton. You will clearly see the difference. Our soft washing technology will leave you speechless. Our results will make your neighbors envious! We’ve cleaned thousands of roofs in Marlton, so we know how to do the job right. Plus, our soft washing detergents and environmentally friendly chemistries will never harm your roof or property. See the difference for yourself below! We Soft Wash Roofs the Right Way! You have to be very careful in caring for your roof. Certain chemicals, detergents and sprays degrade your shingles. In fact, there are a few ‘no-no’s’ when it comes to roof cleaning in Marlton. We never use pressurized spray. Pressure kills roofs. Too much pressure will harm your roof shingles and some of the adhesives that bind it all together. This leaves your roof susceptible to even further damage by the elements. We never use harsh detergents that will attack your roof’s substrate. Most companies will use abrasives and aggressive cleaning agents. While the immediate results may look good, long term damage is being done. In fact, Aqua Boy follows all manufacturer’s specific instructions, so you’ll know your roof is left intact. Don’t be fooled by other out of town companies who claim they are roof ‘experts’. We are local to our community here and stand by our work. In addition, many local businesses support and recommend Aqua Boy for their projects as well. Ask your next cleaning contractor where they live. Chances are, they’re miles away from our township. This leaves both you and your roof vulnerable. Why take a chance with one of the most expensive items to replace on your home? 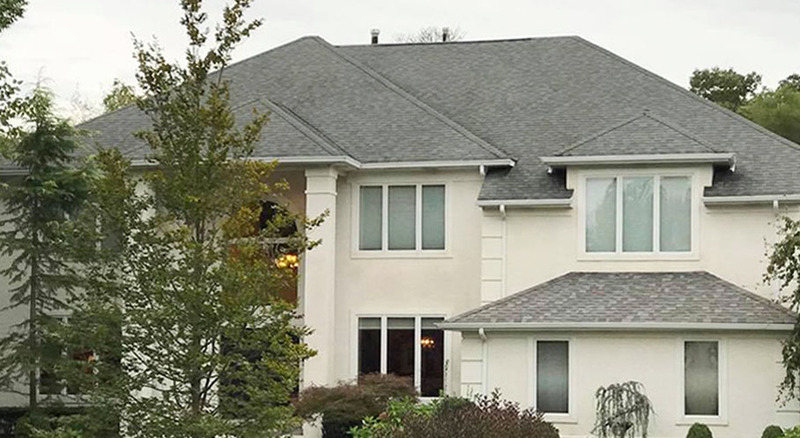 Once your roof cleaning in Marlton is complete, we’ll thoroughly review the results with you. If there are any issues, we’ll address them immediately. 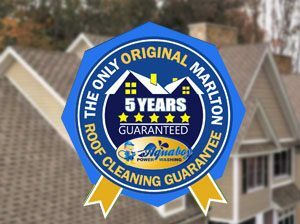 Furthermore, our 5 Year Roof Cleaning Warranty is the leading guarantee in Marlton. No other company can offer our peace of mind when it comes to this. Our reputaion is the HIGHEST in Marlton and South Jersey. Just take a look online and you can see who the leader is. It’s no surprise why we are the most trusted roof cleaner around. We are the most recommended and sought after soft wash roof cleaning in Marlton, Medford, Cherry Hill, Voorhess, Berlin, Moorestown and more! Trust the most awarded company to handle ALL of your cleaning needs. For your home and business alike, Aqua Boy has the best reputation. Ask your neighbors, chances are we’ve cleaned their roof too! Don’t get left in the dark. Those ugly black, green and off-colored streaks on your roof are degrading it. If left unchecked that growth can do some serious damage. Soft washing and roof cleaning in Marlton is our specialty. We’ll take care of everything from start to finish with our Total Care© Roof Cleaning. You’ll quickly realize why we’re the best in Marlton and South Jersey!